Keeping your school’s staff and the students safe is a priority. But security can present a challenge if you don’t have the proper systems in place. Every day, school campuses are at risk for acts of violence or vandalism, but installing a custom commercial security system with video surveillance cameras could be the solution your school needs to prevent and resolve issues that could put your students and faculty members in danger. At Ivanco, Inc., we design customized commercial and business security systems to meet the individual needs of our clients, and we encourage business owners, schools, and other organizations to consider the value of increasing their security to safeguard their grounds as well as those who use them on a daily basis. Most security camera systems utilize IP cameras tied wirelessly to their computer network. IP cameras can be installed and configured to fit needs as they change and have the advantage of allowing remote access to the video feed. For school administrators, this means that the school’s security can be monitored at any time, from anywhere. 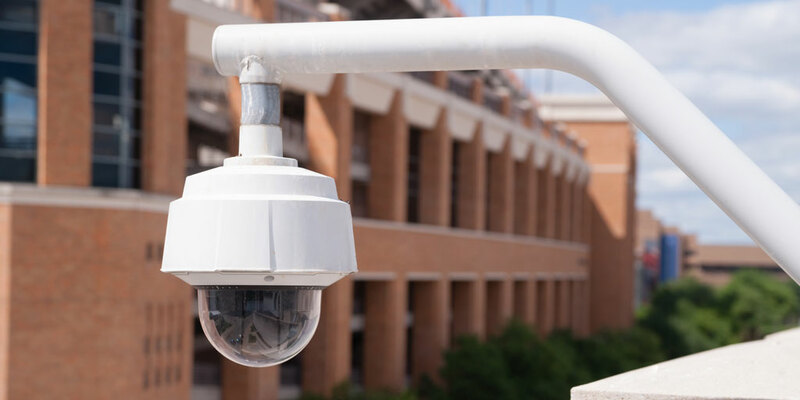 School security cameras are extremely beneficial in that they not only help in maintaining safety on campus but also greatly discourage misbehavior. In fact, studies have shown that clearly visible placement of school surveillance cameras reduces the threat of violence and vandalism considerably. One of the greatest challenges faced by schools is being able to effectively control visitor access. By installing school security cameras at all points of entry, your administrative staff will be better able to monitor visitors and make sure they have been signed in properly while still allowing your students freedom they need on campus. Installing school surveillance cameras in public areas including cafeterias, gyms, administrative offices and outdoor areas like playgrounds and sports fields will help protect your faculty and students. At Ivanco, we believe that securing schools helps secure the futures of our children, and keeping them safe is one of the most important things we can do. Call the team of security systems experts at Ivanco, Inc. to learn more about how our customized security solutions can benefit your school today!